Over the years it has been well established that performing exercises behind the neck, like lat pull downs, is detrimental to the shoulder joint. The unnatural movement pattern of bringing the bar behind ones head causes external rotation combined with horizontal abduction, which places the shoulder at a great risk of injury. However, when the lat pull down is performed to the front of the head, there is a lower stress on the shoulder joint because of a higher degree of stabilization by the rotator cuff muscles. 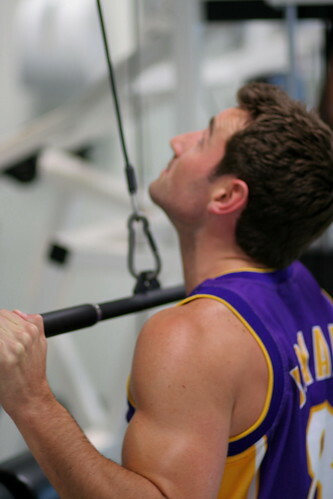 Not only is the front of the neck lat pull down (FNL) a safer exercise, but it allows for a great range of motion. Despite the amount of empirical and anecdotal evidence illuminating the possible negative effects of behind the neck pull downs (BNL), proponents tout is greater efficacy for building bigger lats. But Is there a difference in the activity of the primary movers during different lat pull down exercises? If your objective is to build bigger lats, than any of the 3 exercises in this study can be used with equal activation. However, with no advantage being found in this or any other study to date performing the BNL, one should question it’s use. There is no movement in sport or daily activity that the BNL mimics. Conversely, the FNL mimics movement patters in sports and daily activities helping to reduce injury and improve function. There are a few concerns I have with this and previous studies analyzing prime mover activation in lat exercises. The distance between the hands, which were the same for this and other studies, has a huge impact on the range of motion, the load used, and EMG activation. The closer the grip one uses performing a lat pull down, the greater the range of motion and load, which consequently yields a greater activation of the prime movers. Changing exercises alters movement patterns and muscle recruitment, which can increase or decrease the load used. A greater load, which elicits a greater EMG activation, can always be achieved with movements to the front of the neck as opposed to the back of the neck. For this reason, using the same load for all 3 exercises doesn’t show the true ability of an exercise to activate target muscles. 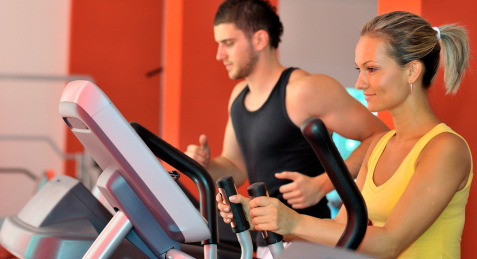 The correct load used would be such that each exercise was performed with maximum intensity. Only then can there be an apples to apples comparison. Like the squat, the deadlift involves the largest muscle groups in the body: the gluteus maximus, hamstrings, quadriceps and erector spinea. And like the squat, it is a very hard, taxing exercise to perform. Consequently, for this reason alone many people don’t use the deadlift in their routines. The gluteus maximus is utilized most in the beginning of the movement when there is a large degree of hip flexion. The glutes work in unison with the hamstring to extend the hips. The hamstrings, located on the back of the upper thigh, become more involved as you begin to decrease the degree of hip flexion as you raise the weight. The erector spinea, which run the length of your spine on both sides, are statically contracted throughout most of the movement keeping the normal curvature of the spine. A static contraction of the rhomboids and the trapezius muscles help maintain the shoulders. The quadriceps muscles are involved with knee extension. Extension of the body occurs when the upper body, torso and pelvis rotate up and back. 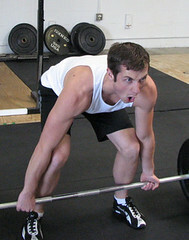 In a properly performed deadlift, this will happen simultaneously with the hips moving forward and the knees extending. Two of the biggest mistakes I see when this movement is performed are locking the knees out before the upper body is extended or allowing the back to “round” and magnifying the kyphotic (upper back) curvature while de-emphasizing the lordotic (lower back) curvature. I need to add that a slight curve of the upper back will present no danger and will happen to most while using heavy weight, but if you look like the hunch back of Notre Dame while performing the exercise that’s a different story. The main reason your lower back would round, which could cause devastating trauma to the lumbar area, is weak erector muscles. There are various exercises you can use to strengthen your lower back like good mornings, arched back good mornings, arched back stiff legged deadlifts, and reverse hyperextensions, but good mornings and its variation in my opinion are probably the best exercise for this purpose.????? ?